It’s beginning to look a lot like Prayer Truck! I smile whenever I see one rumbling down the street. I start counting down the days. It’s like waiting for Christmas, really. 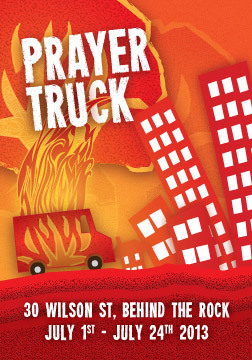 Last year the Prayer Truck was open for three weeks, snugly parked behind the Living Rock. In it we prayed for and with the community. Hundreds of total strangers (many of them now friends) stopped and asked for prayer. Each evening a crowd of regulars congregated around the truck. I affectionately call them “the posse”. This video, produced by our buddy Mark, really gives a good feel for what happens when we reach out to be the loving presence of a people of prayer. We would love for you to join us! Sign up for your hour at the Prayer Truck on our online calendar at http://www.24-7prayer.com/signup/dbaf5a or just drop by July 1 – July 24! We’re open 7 am – midnight on weekdays, and 1 pm – midnight on weekends.